Before: unbalanced chakras, and green indicates a state of transition. This offering is just as effective when performed at a distance or "in-person". Because my work is equally insightful and therapeutic, we coordinate a time to work together via technology - primarily phone call! I'll even record the session and email you the file! Just let me know ahead of time! OK, I confess: this one breaks the mold, no one taught this to me, and every session is unique. I feel your energy fields and allow it to lead me. Sometimes, it's across the room, like 10-20 feet away! Seriously crazy stuff, as I move further and further back following the energetic cords! Many people feel sensations as I tweak and twirl it in my hands. THEN we take a breather as your energy smiles at you and thanks you for inviting me to the dance floor for this energetic waltz. Even better, I often get impressions about the situation. I find that through these impressions, you gain additional insights to help you resolve any unbalanced areas. In a sense, you are getting the therapy and a reading all in one session. Bonus! One client described it as "Reconnection" type work. Others have said they can feel pulling, heat, and other sensations moving around while I am literally across the room! Once I feel the shape of the energy, I gently work with it to restore balance. This is my most requested modality, and for good reason! All of my training comes into play here, so you may receive benefit from many different sources. Together, we uncover insights which result in a different kind of energy session. I'm reading the energy with my hands and interpreting it for you. This allows you to understand and then shift, release, or do whatever you need to do connect with YOUR own inner light being. You may want to bring your journal and take notes after the session. After: Chakras are even, and the blue indicates a state of peace and tranquility. 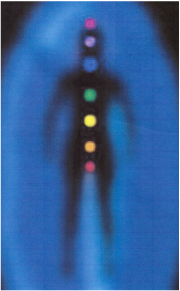 My Reiki teacher in Colorado had an aura imaging machine and - no surprise here - we experimented from time to time. The images are a result of one of our Before & After experiments. A woman came in feeling "off center." I worked on her for about an hour and you can see the results above. More importantly, she felt like herself again! Contact Cici to have her unbraid your energetic knots!